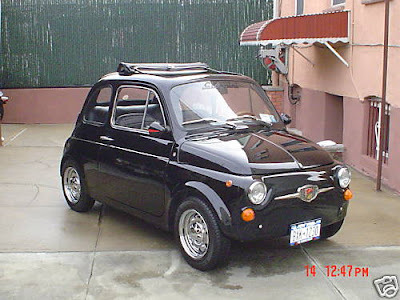 Just A Car Geek: 1975 Fiat (500) Giannini - In US and For Sale on eBay. 1975 Fiat (500) Giannini - In US and For Sale on eBay. Fiat introduced the 500 in 1957. It was the Italian version of a peoples car a la the Volkswagen Beetle. Like the Beetle, the 500 was a rear engined car. The engine in the 500 was an air cooled 497cc 2 cylinder engine (eventually the engine grew to 594 cc). This is one of those fascinating cars that I know little about. If you're familiar with them please post any info in the comments section or e-mail me with the info and I'll post it. Click here to see the only thing close to a definitive Giannini website. Click here to see the 1975 Giannini listed on eBay.